Seismologists categorize Cascadia region earthquakes into 4 different types, depending on where they occur, (their "source zones"). Three types, Cascadia Megathrust, Deep Intraplate, and Crustal Faulting earthquakes, may occasioanally produce strong shaking that can threaten life and property. The fourth type, volcanic earthquakes, are generally too small and remote to cause damage directly, but they provide strong clues about potential volcanic eruptions. In Cascadia strain arises from the interaction of three tectonic plates. The North America, Juan de Fuca, and (idirectly) the Pacific Plate all are moving with different trajectories. Offshore from British Columbia, Washington, Oregon, and N. California, a young oceanic plate called the Juan de Fuca Plate is spreading away from the Pacific Plate and plunging beneath North America. [You might think of building a salami sandwich by holding 2 slices of bread together, and shoving the salami in from the side -- not very efficient, and you're likely to get Mayo everywhere!]. Temporarily locked together (since the great Cascade Subduction Zone Earthquake of 1700), strain is building in the locked interface between these two plates that will be released in future earthquakes. 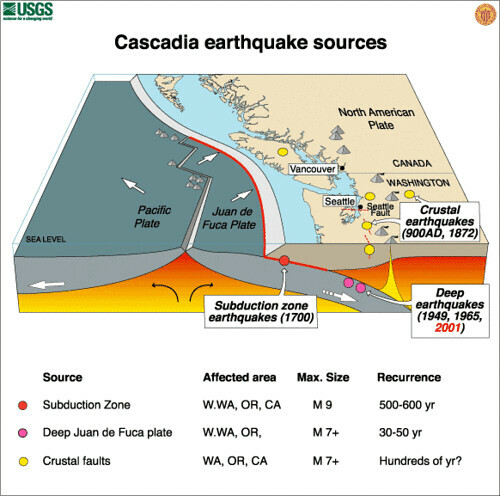 Read more about the Cascade Subduction Zone.